Howard and Fred Go Head-to-Head! Next Wednesday, February 8th, my old friend Dr. Howard Farran and I will take a deep dive into the raging waters of building a dental team! You can be sure that it will be a lively discussion, and will give you some practical ideas on creating a team that will make your practice thrive in this ever-changing economy. It’s a free webinar (retail value $1 million+) so be sure to join in at 11am Pacific, 2pm Eastern, etc. Register here to join the fun! Also, if you can’t watch at those times, if you register you will be sent a full video recording of the webinar, so don’t miss out, register today! Over the past 35 of my business life, I’ve seen many different approaches to team-building. In our own business we refined the process to a very simple philosophy, which I call the Three R’s, which are Retrain, Repurpose or Replace. We have over 250 team members at 1-800-DENTIST, and many different skill sets and levels of income, but this approach works throughout the company. I’ll explain them each in detail. The first step for us when hiring someone is to make sure that they are a cultural fit for the company. Once we determine that, and believe that they can do the job, then they are hired. We then monitor them throughout their career, coaching them, evaluating them and giving them feedback. Sometimes you get an employee that is a terrific cultural fit, but they are missing some key skills, or they have let some bad habits slip into their workday. That’s where retraining comes in. A typical example would be an operator in the call center, who is a great employee, liked by everyone, and has been doing a great job for years. And then suddenly his productivity falls off. Since we record all their calls, we can listen to see where that team member might have drifted from his training. This is when you put them through retraining, refreshing their skills and reminding them of the fundamentals of their job. And usually within a week that team member is right back to her old level of productivity. The same thing can happen with a salesperson, or a customer service team member. Over time it’s easy to drift from the essential behaviors, skills and verbiage that work best, and eventually it shows up in productivity. The manager’s responsibility is to observe this and put the person through retraining as quickly as possible. Also, to really grow employees, you and the individual team members need to be willing to look at their gaps in skills, and offer them the opportunity to close those gaps with education. Retraining then means “more training,” to broaden their skill set and make it possible for them to keep up with the changes in the marketplace as well as develop the skills to advance. In a dental practice, this could mean regular seminars to maintain peak team performance, reminding your team members of the importance of fundamental skills and introducing them to new ones. Or it could mean that the practice has added CEREC, and the assistant needs to learn how to do as much as possible with the new technology, and how to talk about it to the patients. Sometimes you find a team member that is an excellent cultural fit for the business, and is a diligent worker with a positive attitude, but they are just not thriving in the position they were hired for. No matter how much retraining or coaching you do, they remain a “B” player, so to speak. What we do then is try to determine if they would fit better somewhere else in the organization. Why do we do this? Because great people are hard to find. And experience has taught us that most people want to do a great job, but are just better at some activities than others. We have repurposed employees hundreds of times over 30 years. Let’s say someone on the sales team really believes in the product, but just can’t seem to consistently sell month after month. We’ll might then try them out in the customer service department, and suddenly they excel at their new job. We’ve also graduated many people to higher positions. This is another part of repurposing. Some team members may be slipping into lower performance because the job is not challenging enough, and they are not working to their full potential. At that point, their manager could realize their capabilities, and promote them, or another manager could “steal” an employee for her department, when he believes the person is a great fit and would excel in the new role. Now you may be saying, “Fred, this doesn’t work in a dental practice. You can’t repurpose a hygienist, for example.” Really? Maybe she would be a much better treatment coordinator. Or maybe she’s just bored, and if you assigned her the social media responsibility as part of her job she would get jazzed about coming to work every day, and take on an important role. You can even repurpose the dentist. Maybe he or she is not great at case presentation, and is never going to be, despite retraining. Time for that treatment coordinator role again. Do you start to see the possibilities? It’s expensive to find new employees, and it’s expensive to train those employees until they get up to speed in their position. But sometimes that person has got to go. Short of some sort of misconduct, this is our last resort. But we’re not afraid to pull the trigger. If they can’t be retrained and there isn’t a better position in the company for them, or they’ve not succeeded after being repurposed, it’s time for them to work someplace else. As a side note, the hardest team member to let go is a B player who, no matter how you try, is not getting better and will never become an A player. Letting go of C players (and F players!) is easy by comparison. But if you want everyone functioning at an A level, you have to be strong enough to eventually face the fact that this person is never going to give you all that you need. And also–and this is critical to understand–it is not fair to all the other A players to keep that person around. And of course, an invincible team is all A players. I know that employee management is even more challenging in a dental practice, where there is a fairly small number of team members. This is why I recommend two key resources: Dental Post.net and HRforHealth. HRforHealth is a program that, at its most basic level, does all the things that keep you fully compliant with regard to employee laws in your state. But beyond that, it systematizes the review process for your employees, so that if you need to retrain or repurpose them, you’ve already made it clear what your expectations are of them in the position and the practice. And if you do need to terminate someone you can do it without being at risk of litigation, because you’ve laid the legal foundation properly. With HRforHealth, you can easily take advantage of all the human resources tools that large business use, at a very low cost. DentalPost.net is a job search site specifically for the dental industry. It doesn’t cost anything for a potential employee to list him or herself there, and for a reasonable fee the dentist or office manager can search for the best fit for the practice. I recommend it because practices can be very clear about the type of practice they operate, from culture to philosophy to clinical approach, and this makes for a much better hire. The site also does personality testing, so that you can see what type of individual you’re bringing into your team mix, and where they are most likely to thrive and contribute to your invincible team. I hope you find the Three R strategy useful as a guiding principle in building your stellar team. We’ve found one of the biggest benefits is it makes your business a great place to work, which means it is a whole lot easier to attract the best people. That’s a big bonus! As some of you might know, I tore my Achilles’ tendon last month, and it has been quite the inconvenience. But it did force me to slow down from my breakneck-paced life, and reflect on where I want to be in the next five years and the next ten. I found myself re-prioritizing, and getting very clear on what needed to be done on a daily basis in order to achieve my goals. So that’s my simple advice: be clear on where you want to go, and do something every day towards it. Based on a survey we did, it compiles the frank opinions of over 1,100 office managers nationwide about the hot-button topics in their day-to-day lives, and my recommendations on how to conquer those challenges. It’s free, of course, and just click here to register. First up is ScaleUp, a seminar on February 9-11, on how to go from a solo practice to a business enterprise. It’s being held in Dana Point, California and promises to be a unique and enlightening event. I’ll be presenting “5 Strategies for Optimizing Patient Growth.” Along with me, the esteemed Dr. Gordon Christensen, the famous business coach John Maxwell, and group practice wizard Steve Bilt will also be on the docket. Learn more about it by clicking here. Then I’m doing a study club in San Diego on March 3rd for one of my favorite organizations, the American Association of Dental Office Managers. This is open to everyone, with a little fee involved, and Patterson Dental is a key sponsor. The emphasis will be on team building and capitalizing on the digital tools and strategies available to practices now, but I’ll be running all the marketing bases. Register here. After that, my company is hosting its third DSO Summit here in Los Angeles on April 4-5. This is a very exclusive meeting and has sold out both times already. We keep it small, because we want attendees to get to know each other, and it also allows us to do it in our office, where they can see how we operate our call center for 1-800-DENTIST. It’s a deep dive into all the tools your group practice needs to attract and retain patients, from the technology side to the management and marketing arenas. There will be a special guest speaker whom I will not yet reveal to you, but you will not be disappointed. (It’s not me, but I will be speaking!) Register here. There will be more to come, but that’s where I’ll be once I’m back on both feet. Have a great 2017, and I hope to see a lot of you in the coming year! This is the video I showed at Siroworld 2016 for the first time. It’s a comedic take on what it would be like if I became a dentist (and why it would not be a good idea!) The actors in it are my operators from the call center at 1-800-DENTIST, and they did a fantastic job. Hope you enjoy it. And no, it can’t be downloaded, because I don’t really want it distributed to the non-dental public. You’ll be able to figure out why! If you don’t know who Richard Branson is, I’ll explain that he is the creator of the Virgin brand, which started as a record company, then an airline, and now has over 400 different companies under that banner. He’s a multi-billionaire who is now also pioneering commercial space travel with Virgin Galactic. In other words, he’s a wild and fearless pioneer and entrepreneur. And he’s a knight. I had the occasion to spend five days on a business retreat at his island in the British Virgin Islands. It was a spectacular experience, both from a business and a personal perspective. I admire Sir Richard as much for the way he lives his life as I do for his achievements in business and philanthropy, and here are seven things I’ve learned from him that I think are very relevant to dental practices and to business in general, and I wish I learned them a lot sooner. 1. Offer an exceptional product with exceptional service. This is the only way to defend yourself long term against the competition. He told us that the times he failed to do this were the times the endeavor failed. If you can’t do that, in your own way, in your own neighborhood, to some group of patients, then you will be at risk. 2. Sweat the small stuff. It’s all about the details. This is what people notice, and what people remember, and what makes you distinct as a person, a business and a brand. And in this world where your reputation is being created in the digital world every day, whether you like it or not, your brand is everything. You will distinguish yourself by the smallest of details, and by not neglecting anything that the patient experiences. 3. Infuse playfulness into your business and your workday. You may say that you are in health care, and there is no place for that. I totally disagree. Even at its best, dental care is an anxiety-inducing experience. Lighten up the atmosphere in your practice, and encourage your team to do the same, and you’ll see patients respond positively. Why lets kids have all the fun? Play! Remember, it’s about the experience of being a patient, not your clinical skills, that make the biggest impression on your patients. Bring fun into your practice. For me, I realized how much I had let that slip away in my personal life as well. 4. You can’t change the world until you get your own business right. All of us would like, I think, to have some positive impact on the world around us, and perhaps create a legacy. But your first legacy is to have a solid, sustainable business, providing good, secure jobs, or as a team member contributing your best so that the business thrives. Then you can go out and change the world. 6. Turn your disadvantages into advantages. Sir Richard is dyslexic. Also a high-school dropout. This has allowed him to approach the world differently, to extraordinary success. Your disadvantages, either physical or mental, can serve as a motivator to you and also give you a different perspective on the world. It’s a choice to let your disadvantages limit you, rather than discover the new pathways they provide. 7. To get great at something, get great coaching. He plays tennis almost every day with a tennis pro. Whatever he undertakes, he finds the best coaches or advisors to help him. I was not wise enough in my younger years to do this, but now I have remarkable people as resources, advisors and coaches in every area of my life. It saves me money and time in reaching my goals. I’ve learned a whole lot more from Sir Richard, much of it on a personal level. I highly recommend reading his book, The Virgin Way, if you want more insight into how he has shaped his success. He is also the keynote speaker at SiroWorld this summer, which is going to be an amazing and unprecedented event in August hosted by DentsplySirona. I wouldn’t miss it if I were you! Is Your Practice a Tear-down? Fred's new book, Becoming Remarkable, takes your practice to the next level, and helps you create the practice patients can't resist talking about. 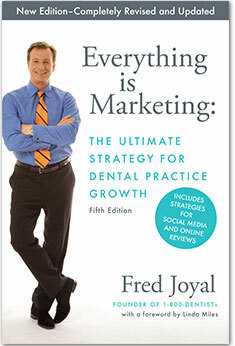 Fred's first book, Everything is Marketing newly revised for 2014, takes you step by step through your practice, revealing how everything you say or do communicates a message to your patients. The Madow Group The baddest brothers in dentistry–creators of The Best Seminar Ever!